Sam and I had always dreamed about doing an around-the-world trip but never quite committed to a ticket due to a lack of money or a job we felt we couldn’t leave. Our honeymoon seemed to be the perfect opportunity to see the world without breaking the bank or having to give up our teaching jobs. Traveler’s Joy helped make this dream a reality, and gave us incredible memories that will stay with us through the years. We flew out of Chicago two days after our wedding night on July 4th and arrived 24 hours later at our hotel in Hong Kong. This was only the first stop on our five-country, five-week tour of Asia that would take us through China, Malaysia, Thailand, Cambodia, and Vietnam. We originally chose Asia because we wanted to go somewhere affordable (once we got there anyway), with excellent food, new cultural experiences, and some time at the beach. I hoped to ride an elephant and see Angkor Wat, and Sam wanted to see orangutans in the wild after sampling Thai and Malaysian curries. We built our trip around what we hoped to see and do, and planned to spend about a week in each of the five countries. Our flights within Asia were through AirAsia, which allowed us to see as much as possible in our five weeks without going over our budget. 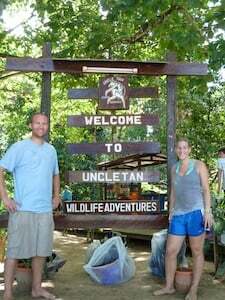 After starting out in the big cities of China, we were ready for some fresh air and flew to Malaysia where we embarked on a two-night jungle tour through Uncle Tan’s tour company. Next, we headed to Thailand to relax on the beach and take cooking classes to learn how to cook Thai food. We eventually headed to Siem Reap for three nights to see the Angkor Wat temples and a floating village, and finally to Hanoi for some nightlife and motorbike madness. Along the way we stayed in a variety of cheap hotels, usually ones we booked ahead of time through websites. Others were suggestions from our friends who have traveled a great deal, or from our guidebook’s recommendations. Along the way we met travelers who helped us select things to see and do, as well as our accommodations. Businesses turn over quickly, and a good recommendation can be the most accurate way to find great service and value on your trip. Our memories from the trip are priceless -- from watching a flight attendant hawk a Mickey Mouse beach towel mid-flight on a sketchy Chinese airline to sharing a jungle hut with two snoring couples in the Malaysian jungle after a day of monkey-spotting. We really had the time of our lives. 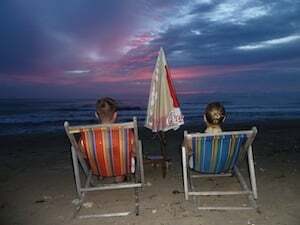 There were adventures, like crossing a simple street in Vietnam, and peaceful moments like sampling traditional Thai cuisine while sitting oceanfront on Koh Lanta, Thailand. 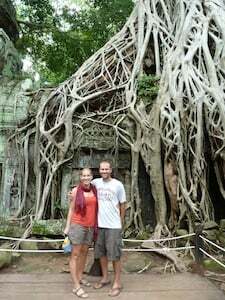 We both agree Cambodia is the most captivating place we’ve ever traveled. It offered us a unique look at a country that is naturally and culturally beautiful but also deeply scarred by a difficult past. We’ll never forget our dawn visit to Angkor Wat where we explored these historic temples nearly by ourselves. To finish our trip on a high note, we sampled some of the local delicacy in Hanoi-snake meat and fermented snake blood shots. Sam even ate the beating snake heart, which he claims cemented his virility and manliness. Our best moments were spent learning about the culture of people we met and sharing memories with our new friends. Meanwhile, a two-on-two volleyball game deep in the Malaysian jungle remains a favorite memory even though “Team America” lost badly to “Team Borneo.” Height isn’t everything, and in fact, it’s pretty irrelevant when one of your opponents has a four-foot vertical jump. I would recommend our honeymoon destination to anyone who is flexible and willing to try new things. There was culture, natural beauty, adventure, and thriving nightlife along the way. We ended up spending $5,000 dollars total for both of us, and Traveler’s Joy helped us significantly with this sum. We raised almost half the money through the website, and people were very excited to hear about how their contribution turned out, from things like, “So how was that elephant ride!? Did you enjoy your beachfront massage? “Were you brave enough to eat the snake heart?” We wrote personalized thank-you cards to let people know how much we had enjoyed their gift, and how much we appreciated this trip that turned out to be the coolest thing we’ve ever done together.